SNP MSP Stewart Stevenson is urging all Banffshire and Buchan Coast residents to get involved in the referendum debate by reading the Scottish Government's flagship guide to independence, which was published today (Tuesday). The 670-page document - the most comprehensive blueprint for independence ever produced by any country ahead of an independence vote - was launched to an audience of hundreds of journalists from across the globe. 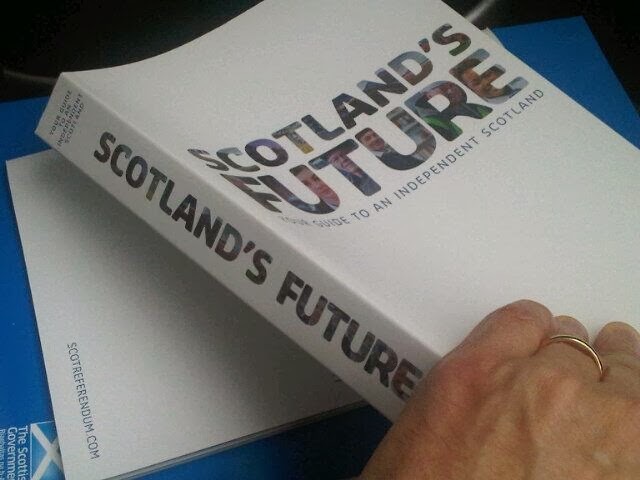 The document Scotland’s Future: Your Guide to An Independent Scotland contains a comprehensive Question and Answer section, running to more than 200 pages, providing answers to 650 questions on independence. The answers – along with downloadable copies of “Scotland’s Future: Your Guide to An Independent Scotland" - are available at www.scotreferendum.com as a fully searchable resource so that residents of Banffshire and Buchan Coast can easily find the answers they are looking for ahead of the referendum. The guide shows how Scotland will move from a Yes vote on September 18th next year, toward its independence on March 24th 2016 – ahead of the first elections in an independent Scotland. It also describes the huge financial savings that can be made – including half a billion pounds on defence spending, and savings from no longer contributing to the funding of the Westminster Parliament. Besides addressing the various questions asked about what independence offers, Scotland's Future also outlines the Scottish Government's ambitious plans to use the powers to make Scotland a fairer, more prosperous country – should the SNP win the first elections of an independent Scotland in 2016. At the heart of this is a transformational increase in childcare provision that would help more people into work – particularly women – and provide up to 35,000 jobs in the process. This only becomes possible with the powers offered by independence, because only an independent Scotland would have the resources to make it happen. Currently all the increased tax revenues that would help make the policy affordable would go to the Westminster Treasury, rather than staying in Scotland. As well as guarantees on the minimum wage and a ‘triple lock’ on pension increases to ensure that they rise at least in line with the cost of living, the Scottish Government also proposes new measures to permanently reduce energy bills by 5% and ensure basic rate tax allowances and credits to rise in line at least with inflation. "This landmark document takes the referendum debate into a new phase. No country in history is as well-equipped as Scotland is to move toward independence, and even the staunchest opponents of Yes now accept that Scotland has got what it takes to be an independent country. “Renewables technology will be an important cornerstone to Scotland’s future economy and it is no surprise that Peterhead has been chosen to be one of the key locations in that development. Local MSP Stewart Stevenson has met with senior officials from Transport Scotland and trunk roads agency BEAR to discuss concerns regarding road safety on the A90 Trunk Road at the Cortes area of Lonmay. Mr Stevenson arranged the meeting, at the Ban-Car Hotel in Lonmay, which included representatives from the local Community Council, local councillor Charles Buchan, and constituents who had contacted him in light of the recent serious accident at the location, when a lorry left the road and ploughed into a residential property causing severe damage. “I was pleased that Transport Scotland and BEAR Scotland officials agreed to my request that they come to Lonmay to hear the views of local residents and the Community Council at first hand. “The officials agreed to take forward ideas for the short term, including flashing chevron warning signs at the bends, as well as look into possible longer term solutions, which I welcome. “I felt this was a very useful meeting. There is a history of accidents at this location over many years. A lot of these will be down to driver error but the authorities need to look and see what further interventions they can make to reduce the possibilities of such errors becoming accidents. Local representatives Stewart Stevenson MSP and Eilidh Whiteford MP have commented on the confirmation that the Post Office branch in St Fergus is to be relocated to the Public Hall in the village. The Post Office will start operating from the Public Hall on Tuesday, 10 December 2013. “I am pleased that the Post Office will be retaining its service in St Fergus. “Post Offices are a vital part of our local communities, which I believe need to be retained. “People who live in smaller settlements should not be disconnected from services simply for where they have chosen to live. The Post Office in St Fergus’ Village Hall will be open from 9.00am to 12.00pm on Tuesdays and Fridays. Banffshire & Buchan Coast MSP, Stewart Stevenson, has welcomed the announcement from the Minister and Children Young People, Aileen Campbell MSP, that more than 100,000 families will benefit from a yearly saving of £700 owing to the Scottish Government’s increased nursery provision. The increase in nursery provision from 475 hours to 600 hours, which has been proposed in legislation which is currently being looked at by MSPs, will add up to a saving of £85 million across Scotland. The extra hours will be available to three and four year olds, as well as the most vulnerable two year olds, reaching an estimated 106,400 families across the country. Local authorities are being given £50 million in 2014/15, with Aberdeenshire Council receiving £2.7 million and Moray Council £900,000 to support this. Councils will from next year have to ask parents what they want for their children in terms of nursery provision, and offer more choice. “The early years of a child’s development are crucial, and I am glad to see that the Scottish Government is committed to extending nursery care. “The increase in nursery care from 475 to 600 hours a year will make a real difference to families both in terms of organising day to day life and in balancing increasingly tight household budgets. “In giving more free hours to three and four year olds and the most vulnerable two year olds, we are ensuring that 121,000 children will have access to more high quality care. This will help the education of our children and support parents who want to get back to work. 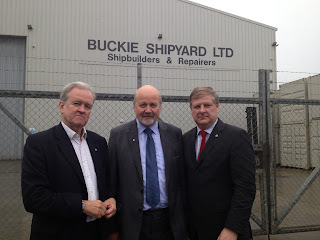 SNP Banffshire & Buchan MSP Stewart Stevenson has welcomed announcement from the First Minister that Independence would create a jobs boost. “It is no surprise to see that Independence would allow the Scottish Government the freedom to do away with that one-size-fits-all Westminster mentality and pursue policies better suited for Scotland. “We aim to create a fair and equal society unlike that created by the current Westminster system, which has produced one of the largest gaps between the rich and poor the developed world has ever seen. Stewart Stevenson, SNP MSP for Banffshire and the Buchan Coast has responded to news that Moray Council Independent and Tory Administration has announced a major climb down on library closures. Moray Council have stated that three libraries out of seven libraries will now remain open - Burghead, Dufftown and Cullen. The Independent and Tory Administration claim that the reason for the U-turn was because they could not afford a lengthy period of litigation. “Obviously, I welcome the news that Moray Council have decided to keep three libraries open, one of which that is based in Banffshire and Buchan Coast constituency. “However, despite this news, I feel that there is a strong case for the remaining libraries earmarked for closure to remain open. “Libraries provide a vital service to rural communities, and the Independent and Tory Councillors in Moray Council have completely disregarded this. It is to the credit of the campaigners that they have forced the current administration to reconsider its decision. In light of this, I now hope that the Council will carefully consider the future of remaining four libraries and the mobile service." 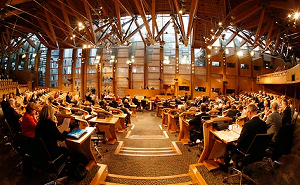 Local MSP Stewart Stevenson has signed up to back Befriending Networks at an event in Parliament this week. The Befriending Networks offers supportive, reliable relationships through volunteer befrienders to people who would otherwise be socially isolated. It has been shown that befriending often provides people with a new direction in life, opens up a range of activities and leads to increased self-esteem and self-confidence. The network is an umbrella body supporting and representing 180+ members befriending services in Scotland. These services support people of all ages who are isolated for whatever reason, by recruiting, training, matching, deploying and supporting volunteer befrienders. The Befriending Network is currently in the second year of a three-year funding cycle, from which they receive £40,000 a year in core funding from the Scottish Government. “With an ageing population it is of utmost importance that we secure funding for the befriending sector and I’m pleased the Scottish Government is supporting this. “Such a humanitarian effort also affords us budget benefits as befriending reduces the burden on other services which people may use inappropriately as they seek social contact. MSP to Sign Cullen Library "Book of Hope"
Banffshire & Buchan Coast MSP Stewart Stevenson will sign the ‘Book of Hope’ at Cullen Post Office, Seafield Street, Cullen on Monday 11 November [tomorrow] at 12.30pm. The Book of Hope has been started by local people campaigning to save Cullen Library from the decision to axe the facility by Moray Council’s Conservative/Independent administration. The book is for local people to write and record what their library means to them and campaigners have invited their MSP to add his name to many people who have already signed. “The tenacity of the local campaigners is commendable and underlines the very strong case that exists for retaining the library here in Cullen. Moray’s MSP, Richard Lochhead, MP, Angus Robertson, and Banffshire & Buchan Coast MSP, Stewart Stevenson, have welcomed the decision by campaigners to save Moray’s libraries to challenge the decision in court. The challenge, being made after receiving positive early legal advice, is being made following the decision by Moray Council’s Independent and Tory Administration to close 7 of its 15 libraries as a budget measure. SNP Councillors and the local MP and MSP have opposed and condemned the decision, which has been deeply unpopular. “Today’s announcement by Save Our Libraries Moray, that are now set to challenge the Council’s decision in court is to be welcomed. I have been inundated with messages about the decision taken by Moray’s Independent and Tory Councillors and I strongly believe that they have taken the wrong decision and it will have a completely disproportionate impact. “SNP politicians in Moray have voted against these library closures and we have joined the campaigners in protest against the decision. This is a passionate campaign about the saving of a critical local service. "The communities of Moray have been rightly shocked by the decision to close seven libraries, which seems to have no strategic or logical basis. The launch of the consultation of the Community Empowerment Bill has been described as a major development for local self-determination by local MSP Stewart Stevenson. “This bill is an opportunity to give people in Scotland’s communities the tools they need to shape the future of their local areas. SNP Banffshire & Buchan Coast MSP Stewart Stevenson has welcomed the news that the United States has lifted its ban on Scotch Beef. This comes after a decision on Friday to issue new import rules for cattle and beef that will comply with international standards for the prevention of mad cow disease. This is the first time that Scotch Beef will be available to American consumers after the United States Department of Agriculture (USDA) banned EU beef and other bovine and ruminant products in January 1998. The ban was imposed at the height of concerns over the BSE disease in cattle. “I am delighted to see that the USDA has taken a monumental decision to break down such a long-standing trade barrier so that the two nations can once again enjoy a flourishing trade and investment partnership. “For 30 years the United States has continued to be the single largest export market of Scottish goods and services. With the lift of this ban the road is clear for the US to now become the greatest appreciator of Scotch Beef. Local MSP Stewart Stevenson has today written to the Chief Executive of Aberdeenshire Council regarding the inspection that was recently carried out by Education Scotland at Banff Academy. Inspectors awarded the school five ‘weak’ ratings in the quality indicators that it was assessed on. “Whilst I know that the staff at Banff Academy work very hard to ensure that they provide a quality education for all pupils, this report shows that there is considerable room for improvement at the school. The No campaign faced embarrassment today as the launch of its ‘academics together’ group was overshadowed by warnings from scientists that Scotland’s progress towards Carbon Capture technology is being held back by the Westminster Government. Speaking on Good Morning Scotland, leading expert in the Carbon Capture and Storage (CCS) field Professor Stuart Haszeldine warned that people in the field are ‘angry and depressed’ by the lack of progress being made. The Professor who chairs the Scottish Carbon Capture and Storage group hit out at the delays, stating “what we’re asking is we get on and do something about it – we stop talking, we start doing. People who’re working on the pure science are depressed that the message is not being heard adequately and the people who’re trying to do something practical working with industry are getting quite angry that they’re being ignored as well and just parked as continually Governments kick the can down the road in the UK and in Europe. Progress towards CCS technology in Scotland has repeatedly hit roadblocks put up by the Westminster Government. In 2007, BP was forced to withdraw from previous plans to develop the technology in Peterhead, citing Westminster dithering and delay while in 2011 plans to install CCS at Longannet collapsed after Westminster failed to reach an agreement on funding. “These warnings that scientists in Scotland are ‘angry and depressed’ by the lack of progress emanating from Westminster are deeply concerning, and ones that everyone in Scotland would do well to heed. “On the very day that the No campaign has launched its academics group, the roadblocks to scientific progress in Scotland that Westminster all too often puts up have been made abundantly clear. “Why does the No campaign think it is better for Westminster to make decisions for Scotland, when time and time again they have dithered and delayed when it comes to backing carbon capture and storage? “Scotland can and should be playing a leading role in the development of this vital technology, and the fact that Westminster has hindered progress in this area - under both Labour and Tory-led UK governments - shows why Scotland can achieve more with the powers of independence. “The fact is that with five universities in the world top 200 – more by head of population than anywhere else in the world – Scotland is in a fantastic position internationally, and that is something we can build on in an independent Scotland. “A Yes vote next year will allow people in Scotland to elect a Government that always supports and prioritises Scottish research, and the development of new technology in Scotland."